EauMG’s Answer: Lol, all of them. You guys know that I have a lipstick problem. You can see that in my Instagram Stories. In the summer, I’ll wear anything. Some of my favorites are oranges, orange-reds, yellow-based browns, mauves, magentas, sparkling lip gloss…you see, all of it! However, I have been drawn to jelly/sheer lip shades recently. What are your favorites? *Cutex 1961 ad from ebay. Sephora is an affiliate link. Thanks! The lip colors I will likely wear the most in the summer will be bright pinks, reds, berry, and orange. However, I’m looking for new orange lipsticks because the two that I have don’t have great staying power or the coverage that I’d like. Right now I’m using CoverGirl Outlast Fireball and Lord & Berry Pinkish Orange Crayon Lipstick. What are your favorite orange (can be coral to pinkish orange) lipsticks that wear well? I have olive skin tone. Oranges – I have to think. I always forget stuff I like, pathetic, I know. I don’t really wear flattering oranges, just emulate the orange/olive combos of nonnas and abuelitas. My favorite obnoxious orange is MAC Morange. Staying power isn’t great but Maybelline Coral Crush is really pretty (a coral that seems really 50-ish/retro). My favorite spendy one is YSL Le Orange. Long-wearing, I absolutely love WnW Catsuit in Flame of the Game (a good dupe for the more expensive Smashbox Thrill Seeker). And I like NYX Soft Matte in Manila (a coral that reminds me of tulips) and Morocco (more of a true coral). San Juan is great too. I usually don’t love liquid lipsticks but the WnW and NYX are comfortable on me. Coloupop Mama is a terracotta orange that I think is absolutely lovely on olive complexions (and wears all day). Thanks, that’s helpful! I think I’m going to start with some Maybellines because they’re cheap and available on Amazon. Trying to decide which coral – Craving Coral, which is matte or Coral Crush. Also, probably going to buy Electric Orange. I’m also considering Tarte Fiery Orange (if I remember the name correctly) in their Rainforest line because I like the way those wear. 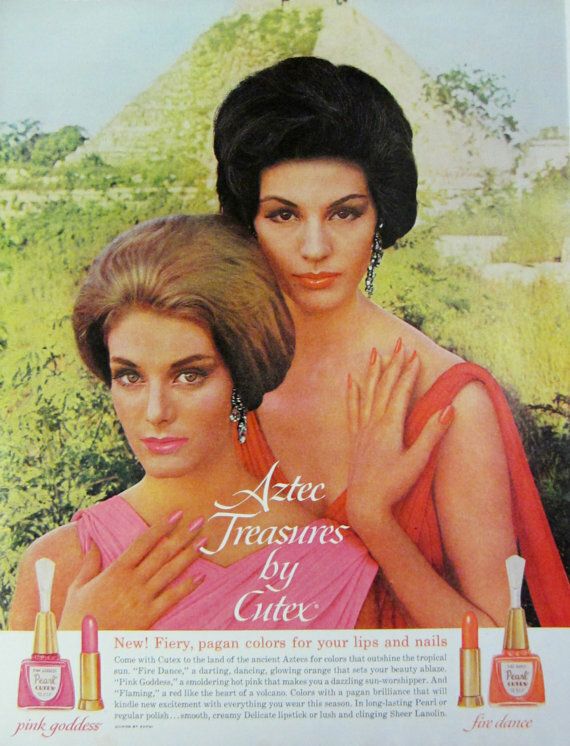 Also, I love the look of the orange lipstick in the Cutex ad! I don’t mind the Maybelline mattes. The ones I have wear comfortably. They had a limited edition one (can’t remember the name), wait a sec, it is Electric Orange! I have that and it’s really pretty. I haven’t tried any of the Tarte Rainforest lipsticks. That one in the Cutex ad is exactly what I want right now. It’s sort of glossy but full-coverage. It’s a good look.